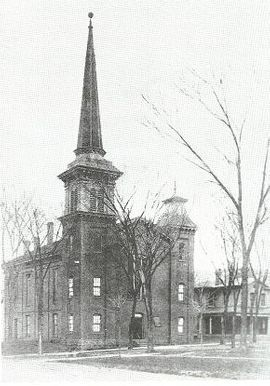 Methodism in Red Wing, MN had its beginning in 1853, the same year Goodhue County was organized under an act of the legislature. Alexander Ramsey was Territorial Governor and it would be five years before Minnesota would achieve statehood. The Rev. John F. Aiton and his wife, and John Bush arrived at Chief Red Wing's Indian Village in the fall of 1848, and the Rev. J. W. Hancock and his wife came in June of the next year. White settlers continued to arrive by river boat, and by 1853 Red Wing was platted. The following year it became the county seat and was incorporated as a municipality in 1857. This was the Red Wing in which the Rev. Chauncey Hobart preached the first Methodist sermon in the spring of 1853. The setting was the log school house of the Presbyterian Mission and the service was attended by the entire white population of the village, at that time about 20 people. The same spring saw the arrival of the Rev. Matthew Sorin on the first river boat to reach Red Wing after the breakup of the ice. On October 17, 1853, the Rev. 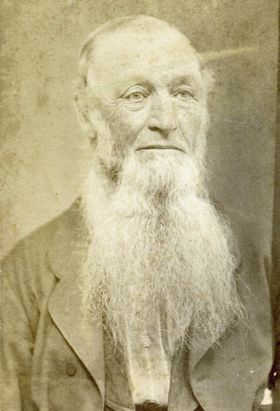 Norris Hobart (Chauncey's twin brother) came to Red Wing and held a quarterly conference meeting in Henry Bevans' log residence located on Bush Street between what is now Main and Third Streets. Among those attending were W. D. Chilson and the Revs. David Brooks, Matthew Sorin, and Rezin Spates. The Rev. Sorin was appointed as a supply pastor for Red Wing for the conference year. A committee was formed to take preliminary steps toward erecting a church building. 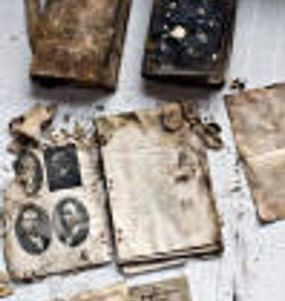 The organization of the Methodist Church in Red Wing took place in November, 1853 when the Rev. Matthew Sorin gathered together a class of 24 members. Meetings were held in the upper room of a warehouse which was used as a schoolroom and church, located about where the Milwaukee freight depot now stands. The charter members were W. D. and Annie Chilson, Maria Sweney, Mathilda Freeborn, Julia Bevans, Thomas and Betsey Smith, Rezin, Margaret, Charles, and Mary Spates, Maria, Elizabeth, Emily, Mary, John, and Susan Sorin, Solomon, Caroline, Edward, Charles, and Mary Rouse, and William and E. Hoyt. 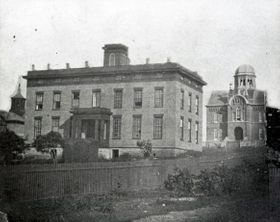 By 1854, the class had increased to 39 and continued to meet regularly in the log warehouse until early 1856 when they moved to the chapel of the newly completed Hamline University, located on the north side of Fifth Street between East and West Avenues. Sunday services continued there until the new Methodist Church on the southeast corner of East Avenue and Fourth Street was completed and dedicated in June of 1858. One year later, on June 2nd, the structure was so damaged by a storm that it was deemed advisable to build a new church. The second church on the same site was completed and dedicated in 1860. A two story brick parsonage was built directly south of the church in 1877. With everything in readiness for Christmas festivities just before Sunday services on December 22, 1907, fire broke out and destroyed the church. Through the generosity of the Christ Episcopal congregation, Methodist Christmas Eve services were held in their church the night of the fire. The next day, the trustees of the Methodist Church met at the First National Bank and appointed Henry Cross, E. C. Erb, and Peter Kempe to make arrangements to build a new church on the same site. While the third church was being built, services were held in the Gladstone building on Bush Street. 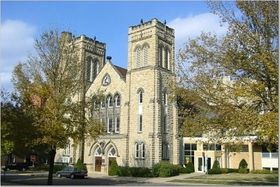 The new church was built of locally quarried stone, and was dedicated on Sunday, December 26, 1909. The Rev. Edward H. Goddell was pastor during the building period. The old pipe organ was reconditioned after the fire and installed in the new church where it continued to serve until a new Moller pipe organ was dedicated in April 1948. The Rev. Edgar Ackerman was pastor at the time of the May 1954 Quarterly Conference, when the decision was made to enter into a three phase remodeling and expansion program. A new parsonage at 919 Central Avenue was purchased and the old one razed to make room for the new activity wing, housing church offices, chapel, friendship room, dining room, and kitchens. This was completed in 1959 when Rev. Warren A. Nyberg was pastor of the church. 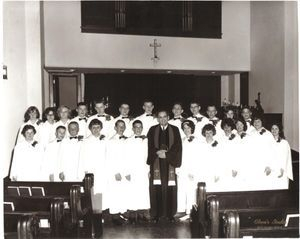 Confirmation Class in front of sanctuary in 1964 before the remodeling of the sanctuary in 1967. The second phase of the program was completed in 1966, when the old basement area was rebuilt into Sunday school rooms. In August 1967, work on the third phase of sanctuary renovation was begun under the direction of architect Edward Barber. Pastor Virgil Coburn took an active role in directing the many volunteer workers involved. Sunday services continued to be held in the sanctuary amid the construction until December 24, 1967. 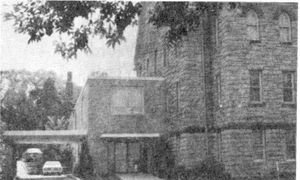 For the next three months, Methodist services were held in the Christ Episcopal Church until April 1968, when most of the renovation was completed. Formal dedication services were held November 10, 1968 when the 115th Anniversary of the congregation was observed. 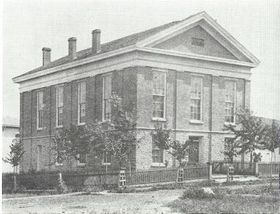 Later, an additional fourth and final phase of the building program was the two story addition on the east side of the church to house the choir, library, board and scout rooms. Completed in January, 1974, this marked the close of a twenty year renovation and expansion plan. New carpet was laid in March 1980. The pipe organ was rebuilt with a great organ for $42,000 and used for the first time on Palm Sunday (March 31, 1985). A building project began in August 1986 to enlarge the foyer, offices, and to install the elevator (where the chapel was located), with project completion in August 1987. New sidewalks were put in June 1995. A new sound system was installed in August 1997. The office came into the computer age in June 1998. The carpeting was replaced in the sanctuary, foyer, and offices in July 1999. Roof-top air conditioners were installed in May 2000 for the sanctuary, Friendship Room, Music Room, and Wesley Hall. A new kitchen stove was installed in the large kitchen on August 22, 2000. In 2001 a new roof was installed, all the windows in the edition were replaced, and the windows in the church were repainted. New louvers were installed in the towers and the stained glass windows were repaired. 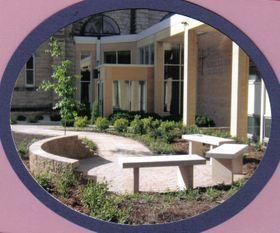 In the summer of 2004 a Peace Garden was planted in front of the office area and dedicated on September 5, 2004. The winter of 2004/2005 the Friendship Room was updated with new light fixtures, furniture, carpets, window blinds, paint, and gas fireplace inserts. Wesley Hall was also repainted and had a gas fireplace insert installed. To make entrance into our church more accessible, we installed Electronic Door Openers on the East Ave. doors in January 2007. New handrails were also installed in the Choir Loft and on the right side leading up to the Lecturn and Altar area. We have an ongoing Art Display upstairs in our Friendship Room by local artists. This exhibit is changed out every 6 weeks. Our goal is to purchase art from our local artists so we have a permanent display. During the summer of 2009 we had a sprinkler system installed in the Peace Garden. Terry Olson also repaired the four stained glass windows in the balcony that depict the parable of the seeds. In May of 2010 the organ was again updated with a new pedal board with under key contacts, a new face board with 40 new tilting tablet actions, 40 new K/A tablets, 23 new thumb pistons, 3 toe pistons, a new Solid-State Logic, Ltd. CapLite capture system with 200 levels of memory and 4 new solid-state switches to enhance the Pedal organ. The cost of this was $17,400 and was raised easily by members and with memorials. Olson-Lethert Organs, Inc. did the work which was the same company that did the upgrade in 1980. The choir wall was moved back a foot to give a little more room. While we have recorded here the early beginnings of Methodism in Red Wing, as well as the efforts over the years to provide adequate facilities for a growing congregation, we are also mindful that the true history of the Church has been made at the baptismal fount, the marriage altar, the communion rail, and in the hearts and lives of the men and women who have sought through this Church to find that wisdom and happiness found only in the humble obedience of God's will. We celebrate our 165th anniversary as a congregation with a Planned/Legacy Giving Initiative. On May 23, 2010 the congregation of the First United Methodist Church replaced and rededicated the Time Capsule. The contents we decided to include are: The Message Bible, a United Methodist Hymnal and The Faith We Sing Hymnal, a current membership list, a history of the church booklet, a 2009 Advent devotional booklet that the members wrote themselves, bulletins from the 12/27/2009 dedication of the 100 year old church sanctuary building and from 5/23/2010 rededication of the time capsule, information about the four cemeteries we maintain, the 2009 year end financial report, photos of members, photos from the original time capsule from 1909, and some information about the United Methodist Women. 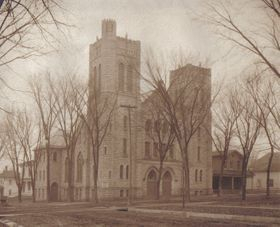 The second Methodist-Episcopal Church in Red Wing was destroyed by a fire on December 22, 1907. When the congregation decided to rebuild, they installed a time capsule behind the corner stone block. They dedicated this new sanctuary building on December 26, 1909. On December 27, 2009 we rededicated our current 100 year old sanctuary building and displayed the contents of the 1909 time capsule. We installed a new time capsule on May 23, 2010 with the hope it will be opened in 100 years. Items in the 1909 Time Capsule and location of Current Time Capsule.